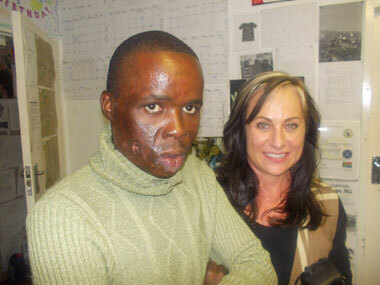 Andani Mphapuli was badly burned when set alight by his stepfather as a 12 year old boy. The man jailed for 107 years, served only 11 years. Early in 2013 the assailant was released without Andani or his family being forewarned. One of the many repercussions of the attempted murder is that Andani has lighter pigmentation in the centre of his face. He has had medical tattooing (also called permanent makeup) done before. The damaged skin only holds the dye for about three years. Now he has met Adri Pretorius who works with Skin Renewal in Parkhurst and she has offered to help darken the affected area again.